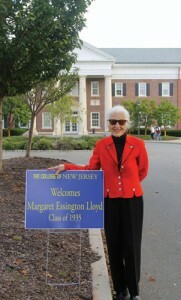 Margaret “Peggy” (Essington) Lloyd ’35 paused outside the Social Sciences Building and surveyed the bustling walkway running toward Paul Loser Hall. “This was all woods and pathways when I went here,” she said, smiling as she recalled the scene. Though she was one of the first students to call this campus home, Lloyd hadn’t visited in years, and she was processing the changes she saw. “We used to eat our meals in a wooden building way over there,” Lloyd said, pointing toward the Education Building but referring to The Hillwood Inn. 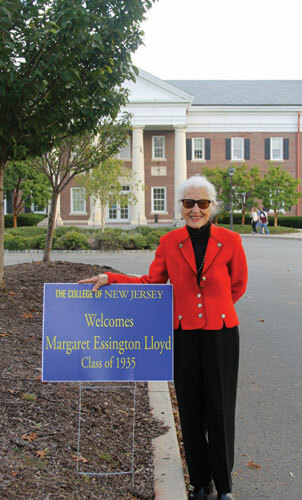 “And I’ll tell you something I haven’t told anyone today,” the energetic centenarian added, before divulging that she was among the students who, dressed as Pilgrims, processed by candlelight to the Inn that first Thanksgiving on the new campus, creating a College tradition that continued for decades. The memories came flooding back more quickly then: living under the watchful eye of Vernetta Decker, writing for The Signal and Seal, singing for Mabel Bray’s choir and glee club. When the Great Depression erased her tuition fund, Lloyd resolved not to let it prevent her from graduating. With help from President Roscoe West, she found a job and worked her way through college. Faculty opened their homes to her so she had a place to stay. She hasn’t forgotten those gestures. “I’m so thankful. My teaching degree got me so many interesting jobs,” she said, before detailing a resume of epic proportions: history teacher, ad agency founder, stringer for two New York dailies, ski instructor for the USO, globetrotting chaperone for the Miss America Pageant. Lloyd eventually settled in Ocean City, NJ, with her husband, John. 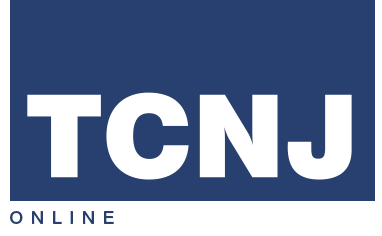 For the last 40 years, she has advocated for the town’s Pops Orchestra and Arts Center. The latter organization is particularly dear to her because of the joy it brought her late brother, Sonny, who battled dyslexia but found a creative outlet in art.